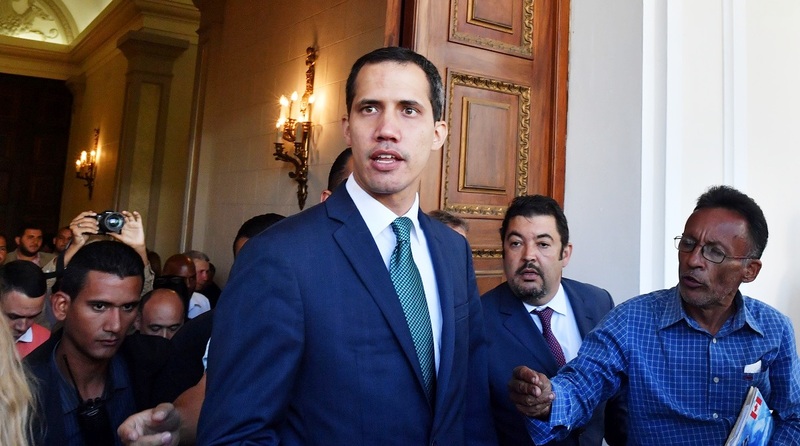 Guaidó, at another remove, contends with frozen bank accounts; but can yet mobilize popular support. Venezuela is in turmoil. The beleaguered President’s pledge to hold elections has done but little to stem the tide of popular disaffection, as witnessed over the weekend by the spectacular display of people’s power, recalling the anti-Marcos movement in the Philippines in the 1980s and more recently the Umbrella upsurge in Hong Kong. Maduro has plainly responded to the demand for fresh elections, but not to the resounding shrill for his resignation. He remains loath to step down quite yet. In effect, the embattled nation now has two Presidents, with Juan Guaidó declaring himself to be the Head of State barely a fortnight ago. He has let it be known that he will hold the office until elections can be held. The resultant gridlock is without parallel in Latin America. Maduro, who is in office on the spurious strength of a disputed election, has little or no public support not the least because he has brought the country to the brink of economic ruin. He retains the backing of the military, however. Guaidó, at another remove, contends with frozen bank accounts; but can yet mobilize popular support, as witnessed on Sunday. He has the support of western democracies, but little control over the levers of power within Venezuela. Although Maduro retains the backing of his allies, notably Russia, Turkey and Cuba, he has come under unprecedented international pressure from a dozen Latin American countries and also, of course, Donald Trump’s America. The US has ramped up the pressure on Maduro with sanctions on Venezuelan oil, the primary source of revenue. And for all its ostrensible support, disaffection is brewing within the military, which plays a pivotal role. The has been a string of defections by junior officers, most recently the switching of sides by Maduro’s military attache to the embassy in Washington DC and the consul in Miami. The crisis is dire and a change at the helm will scarcely placate the restive Opposition and the people in the wider canvas. The short point must be that Venezuela, after a bout of repressive Leftist rule and a tottering economy, cries out for the restoration of democracy. If political options are closed, the risk of Maduro’s opponents opting for an armed struggle is dangerously real, given Latin America’s troubled history of insurgencies. Unless a new leader can place the country’s wrecked economy back on the railes, millions will continue to flee, destabilizing the region further still. Of 32 million citizens, three million have fled the country already. faced with a crippling shortage of food and medicines. The current standoff is forbidding and a transition back to democracy would be quite the most rational option. Maduro has little to gain and much to lose by surrendering power. He has let it be known that he is open to negotiations, mediated by an international broker. And yet the overture might turn out to be a strategy to bide time and divide the opposition.